Travel through the village of Betws y Coed in the Conwy Valley and head to Capel Curig which lies in the heart of Snowdonia on the river Lugwy taking in the stunning views along the picturesque pass to Llanberis. Visit the Welsh Slate Museum situated under towering slate mountains. The Victorian engineering workshops of Dinorwig Slate Quarry is a living, working museum that tells the story of the North Wales’ slate Industry. Enjoy a stunning introductory film show, slate-splitting demonstrations, explore the furnished quarryman’s houses and marvel at the giant waterwheel on-site. Just beyond the Museum is a variety of independent shops/workshops selling hand-made Padarn pottery as well as slate gifts and souvenirs. Take a short coach journey to the Royal Victoria Hotel, Llanberis for lunch, set in 30 acres of garden and woodland that include Dolbadarn Castle. 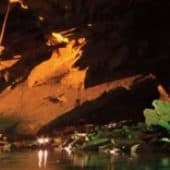 A visit to Llechwedd Slate Caverns at Blaenau Ffestiniog is a must it’s here that your group can experience the story of the men who built this incredible industry which literally helped to ’roof the world’. This new tour uses cutting-edge enhanced reality technology to tell the story of the miner’s determination and resilience as they worked. It’s a real insight as to how our mining forefathers lived, the importance to them of family, friendship and community, and how their lives have shaped our own – and still do. Evening meal at the hotel will be a real ‘Taste of Wales’ as the main ingredients are locally sourced followed by an evening with a local choir rehearsal – a unique and moving experience. Day 1 – Discover the hidden delights of Llangollen renowned for its hills situated on the river Dee, this small town has something for everyone from independent shops, a motor museum, tourist information centre, historic buildings and much more. 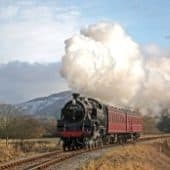 Climb aboard the train at Llangollen railway located beside the historic Dee Bridge (built in 1345) and journey through the picturesque Dee Valley to the town of Corwen. This small section of line, offers a sample of the sights and sounds of yesteryear passing through some of the finest natural beauty North Wales has to offer. From lambs in Spring to the multicolored falling leaves of Autumn, the views from the carriages are picturesque and ever changing. As well as steam hauled trains there are Diesel locomotives and Heritage Railcar services on selected days throughout the season. A journey on the Railway takes you back to how travel used to be. Day 2 – Take a two hour leisurely trip on a motorised boat across the Pontcysyllte Aqueduct and Canal World Heritage Site built by Thomas Telford between 1795 and 1805. Fondly known as the ‘stream in the sky’. Enjoy light refreshments on board plus a running commentary along the way. Depart the boat and head for Chirk Castle in the ownership of the National Trust the only one of Edward I’s marcher fortresses still inhabited today. Explore the Adam Tower, complete with its two-level dungeons, and murder holes. There are guided tours available for groups or self-guided facilities. For those who are interested in the outdoors there are many walking trails around the fascinating 480 acre parkland to enjoy. This foodie tour starts at Bodnant Welsh Food Centre located in the stunning surroundings of the Conwy Valley. Originally built in the 18th century the farm buildings have been sympathetically restored to a ‘must visit’ centre. Take a stroll through the farm shop full of local produce, artisan bread and food related gifts, then on to the wine shop followed by refreshments in the court-yard café. Book a demonstration by Dai the resident Chef to learn some hands-on cooking tips and sample his savoury delights. Head for the coast and make a detour to visit Conwy Brewery in the elevated village of Llysfaen with spectacular coastal views. Taste one or several of their award winning beers on a personalised tour and learn all about the fascinating process of beer making. 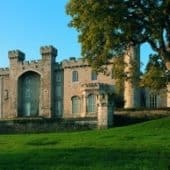 A short drive along the A55 coastal route takes you to Bodelwyddan Castle for a tour of this gallery an outpost of the National Portrait Gallery and a range of interesting exhibitions. New in 2016 will be the opening of the World War I trenches to see where soldiers trained before being posted to fight for their country overseas. A must before leaving is a pot of tea and a Welsh cake in the Victorian tea shop. Dinner at the hotel will be a real ‘Taste of Wales’ as the main ingredients are locally sourced. Remember to ask for that cheese which is matured down the Slate Caverns at Llechwedd!! as a royal palace and military fortress, was at the core of the medieval walled town. The story of the town is told in a new exhibition at Oriel Pendeitsh, and includes the history and story about the Princes of Gwynedd dynasty. Visit the town’s shops, cafes and restaurants to taste the local produce or enjoy a journey through scenic Snowdonia on the on the Welsh Highland Railway which runs for 25 miles to Porthmadog.